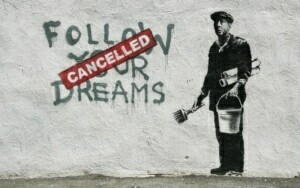 Popular culture and high art in many respects are regarded as standing in complete opposition to one another. Pop-culture in its mass production, universality, commodification, and wide accessibility is largely seen as artistically and conceptually inferior to that of high art. The latter then can be seen as the anti-thesis of pop-culture, where Raymond Williams in his essay On High and Popular Culture sees high art as “the great body of cultural skills and the great works which embody and represent them.” So where and how does the intersection of “cultural skills”, “great works” and the aforementioned mass production and universality occur? Can a piece of art be both “popular” and “high”? Take the phenomenon of Banksy for example, the street artist whose tongue in cheek graffiti, rife with political and cultural commentary has been catapulted into the upper echelons of the art world through viral moments and word of mouth. Is it time to rid the art world of the antiquated dichotomy of high and pop art in a cultural economy that thrives on the homogenization and reproduction of artistic forms? Williams writes of the distinction between high and pop art “there can be no simple contrast between the “high culture” of a social class or occupational group and the “popular culture” of the rest of the people. There are evident and important differences of degree of access and use, but these are contingent social and historical relationships.” In saying this, Williams is alluding to an explicit division between these cultures, which is no longer of such importance. In a modern era where visual and artistic cultures are highly accessible and increasingly recycled through digital interfaces, the degree of difference that Williams speaks of has been diminished significantly since his article was written in 1971. With the advent of the Internet and digital media, stories, histories, visuals, sounds, and ideologies are shared and transmuted at an unprecedented rate. The canon of pop culture and high art in our modern era is at the disposal of any artist who wishes to draw upon it and in this sense, the distinction between cultural markers is diminished significantly. The history of this transition can be traced back to the early 20th century, however, the most significant milestone in the convergence of high and low art can be located during the Pop Art era of the 1950’s or the “neo-dadaist” movement. The movement presented challenges to the traditions of fine art, placing banal and often mundane commercialized imagery in the context of traditionally high art settings. 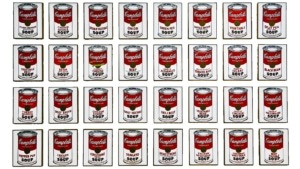 The iconicity of this era has permeated popular culture ever since; Andy Warhol’s Campbell’s Soup Cans, being one of the most recognizable symbols of Pop Art. The movement sought to challenge traditional elitist conventions of art and was the pivotal beginning of postmodern era. 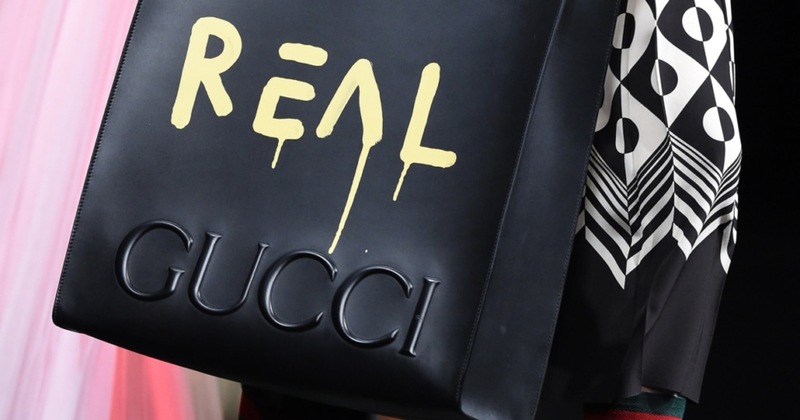 This phenomenon points to a reverse Warholian experience in which high fashion brands have begun to co-opt the simulacra of their own likeness. Instead of bringing popular culture into high art, we now see high art appropriating popular cultures representations of high art. Similarly, we now have Vetements, the subversive, normcore, streetstyle brand which has a complete irreverence for following fashion rules now showcasing their collections during Couture week. 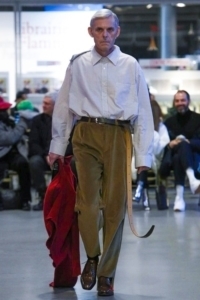 This January they sent senior citizens in shockingly banal everyday work wear down the runway in a complete inversion of expectation and convention. So what has changed in terms of our perception of High vs. Low Art, and how can the two co-exist in these spaces simultaneously in today’s world? In the case of Vetements and Gucci, the answer lies in the history of artistic institution and practice. 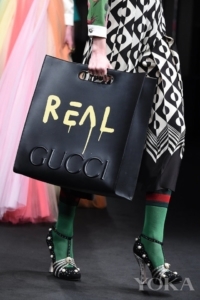 As Raymond Williams stated high art is constituted as “the great body of cultural skills and the great works which embody and represent them.” In this sense, skill has been one-half of the distinction between “high art”, “the works” which represent them, and thus the contexts and sites at which we encounter these “great works.” Gucci and Vetements have found new territory for high art and low art to co-exist simultaneously, in the very subversion of the antiquated practices that divide the two. 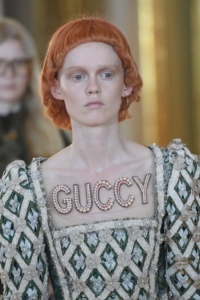 The implicit commentary that can be extracted from “Guccy” and normcore parading down the catwalks of couture week, is that conceptuality is decidedly just as integral as craft in contemporary art.